What are pool pavers and how can they enhance the appearance of a home or other establishment’s swimming pool area? While these pavers come in various sizes and shapes, a pool paver is typically a rectangular paver that is used especially for an outdoor swimming pool area’s construction. These pavers can be organized to compliment various design concepts due to the pavers’ various sizes, colors, and shapes. A lot of shapes, patterns, and colors of pool pavers are available to people with various needs and aesthetic preferences. However, one must make sure to choose pavers that are slip-resistant. The most common materials used to make these pavers are stone, brick, and concrete. Brick and concrete pavers are man-made. This means that they can be produced in various shapes. These pavers are also versatile, meaning they can be used in applications in the landscaping of external poolside areas. 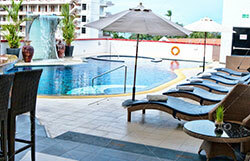 The colors of pool pavers that are best suited for one’s pool area are the medium shades. These shade include tan, golden copper, apricot, camel, rust, and sandstone. Combining 2 or 3 of these colors can create a dynamic effect. This combination of colors can blend with surrounding features like water features, backyard designs, and gardens. When using pool pavers made of concrete, it is important to seal them properly. Unlike most natural stones, concrete is porous and the pigment in the concrete is known to fade because of excessive water damage and sun exposure. Moreover, if color pavers are utilized for pool coping, sealants are also needed. Once a person has made the decision to add pavers around the pool deck, the next step is the selection of paving pattern, color, and the shape. There are many designs of pool pavers to choose from, ranging from basic patterns to the more intricate and unusual designs. Some pavers’ shapes include rectangular, square, circular, oblong, star, hexagon, diamond, triangular, and irregular. Various patterns and designs can be derived using these shapes. However, for customers who want to have more quirky designs and patterns, they can have their pavers custom-made. Another kind of pool paver is the interlocking paver. Aside from interlocking pavers’ decorative value, they are also valued for their safety attributes. They are designed so they interlock with one another securely during installation as the sides of interlocking pavers have edge lip wedges. If a homeowner would want to beautify his or her pool area, it is wise for the homeowner to invest in pool pavers that are also slip-resistant. A “pool paver” refers to any regular type of paver that can be used specifically for the construction of an outdoor poolside area. Pool pavers can be arranged to compliment many types of design schemes because of their large variety of shapes, colors and sizes. 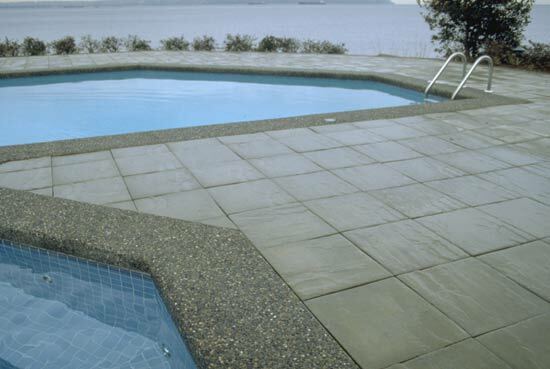 The variety of patterns available for pool pavers offers a wide range of choices for consumers. These different patterns create interesting effects when landscaping outdoor poolside areas. During the early periods of the swimming pool industry and up until the recently there had existed a hesitation to recommend pavers for poolside applications. This concern was founded upon the fact that paver joint sand washing into the pools and causing pump abrasion or harmful bacteria developing in the sand. However, this issue has been resolved during recent times, with the introduction of a stabilizing sealer. Make you have your pool pavers treated with a stabilizing sealer and these problems will be overcome. It is important to remember that a salt resistant paver should be selected when determining which type of paver to use for a salt-water pool pool area. The reason being is that salt can affect the durability of the paver and so this must be avoided. Quite a few brick manufacturers have such pavers, consult your local paver retailer and ask for pool pavers that are salt water resistant. Pool Coping is the term used to describe the capping of the pool shell wall. Coping protects the actual structure from water damage. Pool Coping can also protect those using the swimming pool, for it caps the edges of the pool with a rounded finish. This prevents people from injury when getting in and out of the pool. This choice of material for Pool Coping is very easy to install, for it is available in uniform thicknesses, unlike natural stone. Precast Concrete Coping is also available in a wide variety of colors, textures and patterns. Natural Stone and Brick Pool Copings offer an aesthetic appeal, with warm textures, along with the strength of the stone. There are many choices; granite, limestone, sandstone, clay brick, all with the guarantee of lasting a lifetime. Poured Concrete has the advantage of making the Coping one whole unit, and taking it right to the edge, so there is no break. It can give the deck clearer lines and make a small edge around the pool pavers look a lot wider.